When you add a tax code, you will be required to enter its tax formula. This formula, which is based on the net amount of the expense, determines how TimeLive calculates the tax. Click on the button +Add Tax Code at the top-right of the screen. Enter new Tax Code name in the 1st field and the formula in the 2nd field. Click on Add Tax Code button to add a record. In Tax Code List, click on the gear icon on the right of the Tax code you want to edit and click Edit Tax Code option. 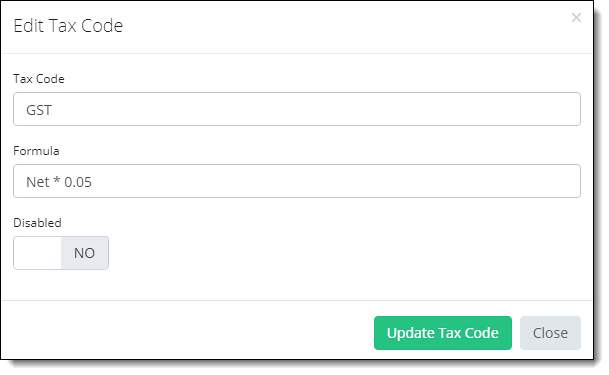 Update your required modification in [Tax Code Information] form. Click on Update Tax Code button to update this record. In Tax Code List, click on the gear icon on the right of the Tax code you want to delete.